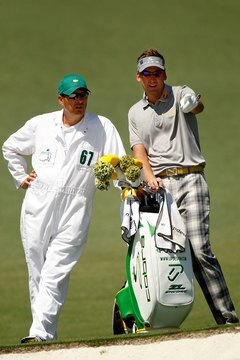 Caddie Terry Mundy (left) helps Ian Poulter plan a shot during the 2012 Masters. Each local golf course or club may create its own regulations regarding caddies who are employed during casual play. For tournament play, the Rules of Golf, as published by the U.S. Golf Association, includes standardized regulations that apply to caddies during competition. Section II of the Rules of Golf defines a caddie as a person “who assists the player in accordance with the Rules, which may include carrying or handling the player’s clubs during play.” When a caddie works for more than one player during a competition, he’s considered to be working for the player who is currently preparing for or taking a stroke, except when the caddie is taking “specific directions of another player,” in which case the caddie is considered to be working for the player giving the directions. The distinction becomes important if the caddie violates the rules. Pursuant to Rule 6-4, a player may only use one caddie at a time. In stroke play, the player loses two strokes at each of the first two holes during which she uses more than one caddie. In match play, the offender loses each hole during which she uses more than one caddie, up to a maximum of two lost holes. Under Rule 6-1, the caddie is responsible for knowing the Rules of Golf. Should the caddie violate any rule, the player is penalized as if she committed the violation. Under Rule 18-2, a caddie may help search for his player’s ball, but may not purposely touch the ball or cause it to move. Doing either risks a one-stroke penalty. A caddie may also help search for an opponent’s ball. Rule 17-1 permits the caddie to attend, remove or hold up the flagstick before the player takes a shot. If the caddie is not attending the flagstick prior to the shot, however, he may not remove or hold it up during the player’s swing or when the ball is in motion. Violation of the rule may result in a two-stroke penalty, or -- in match play -- loss of the hole. The player may receive the same penalty if the ball strikes either the flagstick while the caddie attends it, or strikes the caddie. A caddie may offer advice to the player regarding any shot under Rule 8-1. The advice can include his thoughts with respect to the putting line, although the caddie may not touch the green, and he may not position himself along the target line of the ball while the player is putting. Appendix 1, Section 2, of the rules permits a tournament committee to prohibit the use of caddies or to restrict the choice of caddies. For example, a committee might stipulate that a player may not use a “professional golfer, sibling, parent, another player in the competition, etc.” as a caddie. Local jurisdictions may also include supplemental caddie regulations. For example, the Southern Nevada Golf Association requires caddies to follow the players’ dress code. Additionally, each player must provide the name of her caddie prior to a competitive round. The player may switch caddies during a round, but she must inform a tournament committee member of the substitution. How Long Does a Player Have to Take a Shot in Golf?